Distribution of pterosaur fossil locations. Colored species or genera names correspond to their taxonomic group. Adapted from Witton (2013). Taxonomic groups based on Unwin et al. (2010). Pterosaurs (/ˈtɛrəˌsɔːr, ˈtɛroʊ-/; meaning "winged lizard") are flying reptiles of the extinct clade or order Pterosauria. They existed from the late Triassic to the end of the Cretaceous (228 to 66 million years ago). 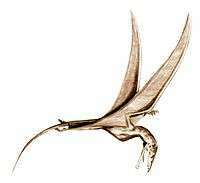 Pterosaurs are the earliest vertebrates known to have evolved powered flight. Their wings were formed by a membrane of skin, muscle, and other tissues stretching from the ankles to a dramatically lengthened fourth finger. Early species had long, fully toothed jaws and long tails, while later forms had a highly reduced tail, and some lacked teeth. Many sported furry coats made up of hair-like filaments known as pycnofibers, which covered their bodies and parts of their wings. Pterosaurs spanned a wide range of adult sizes, from the very small anurognathids to the largest known flying creatures of all time, including Quetzalcoatlus and Hatzegopteryx. Pterosaurs are often referred to in the popular media and by the general public as "flying dinosaurs", but this is scientifically incorrect. The term "dinosaur" is restricted to just those reptiles descended from the last common ancestor of the groups Saurischia and Ornithischia (clade Dinosauria, which includes birds), and current scientific consensus is that this group excludes the pterosaurs, as well as the various groups of extinct marine reptiles, such as ichthyosaurs, plesiosaurs, and mosasaurs. Like the dinosaurs, and unlike these other reptiles, pterosaurs are more closely related to birds than to crocodiles or any other living reptile. Pterosaurs are also colloquially referred to as pterodactyls, particularly in fiction and by journalists. Technically, "Pterodactyl" refers only to members of the genus Pterodactylus, and more broadly to members of the suborder Pterodactyloidea of the pterosaurs. While historically thought of as simple, leathery structures composed of skin, research has since shown that the wing membranes of pterosaurs were highly complex and dynamic structures suited to an active style of flight. The outer wings (from the tip to the elbow) were strengthened by closely spaced fibers called actinofibrils. The actinofibrils themselves consisted of three distinct layers in the wing, forming a crisscross pattern when superimposed on one another. The function of the actinofibrils is unknown, as is the exact material from which they were made. Depending on their exact composition (keratin, muscle, elastic structures, etc. ), they may have been stiffening or strengthening agents in the outer part of the wing. The wing membranes also contained a thin layer of muscle, fibrous tissue, and a unique, complex circulatory system of looping blood vessels. As evidenced by cavities in the wing bones of larger species and soft tissue preserved in at least one specimen, some pterosaurs extended their system of respiratory air sacs (see Paleobiology section below) into the wing membrane itself. 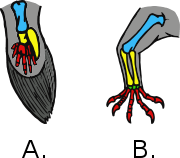 The pterosaur wrist consists of two inner (proximal) and four outer (distal) carpals (wrist bones), excluding the pteroid bone, which may itself be a modified distal carpal. The proximal carpals are fused together into a "syncarpal" in mature specimens, while three of the distal carpals fuse to form a distal syncarpal. The remaining distal carpal, referred to here as the medial carpal, but which has also been termed the distal lateral, or pre-axial carpal, articulates on a vertically elongate biconvex facet on the anterior surface of the distal syncarpal. The medial carpal bears a deep concave fovea that opens anteriorly, ventrally and somewhat medially, within which the pteroid articulates. There has been considerable argument among paleontologists about whether the main wing membranes (brachiopatagia) attached to the hind limbs, and if so, where. Fossils of the rhamphorhynchoid Sordes, the anurognathid Jeholopterus, and a pterodactyloid from the Santana Formation seem to demonstrate that the wing membrane did attach to the hindlimbs, at least in some species. However, modern bats and flying squirrels show considerable variation in the extent of their wing membranes and it is possible that, like these groups, different species of pterosaur had different wing designs. Indeed, analysis of pterosaur limb proportions shows that there was considerable variation, possibly reflecting a variety of wing-plans. Many, if not all, pterosaurs also had webbed feet. Reconstruction of crests: three crested tapejarids. 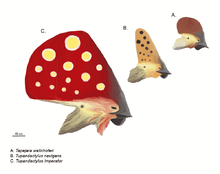 From top to bottom: Tapejara wellnhoferi, "Tapejara" navigans, Tupandactylus imperator (drawn to scale). At least some pterosaurs had hair-like filaments known as pycnofibers on the head and body, similar to, but not homologous (sharing a common structure) with, mammalian hair. A fuzzy integument was first reported from a specimen of Scaphognathus crassirostris in 1831 by Goldfuss, and recent pterosaur finds and the technology for histological and ultraviolet examination of pterosaur specimens have provided incontrovertible proof: pterosaurs had pycnofiber coats. Pycnofibers were not true hair as seen in mammals, but a unique structure that developed a similar appearance. Although, in some cases, actinofibrils (internal structural fibers) in the wing membrane have been mistaken for pycnofibers or true hair, some fossils, such as those of Sordes pilosus (which translates as "hairy demon") and Jeholopterus ninchengensis, do show the unmistakable imprints of pycnofibers on the head and body, not unlike modern-day bats, another example of convergent evolution. The head-coats do not cover the pterosaur's large jaws in many of the specimens found so far. Some (Czerkas and Ji, 2002) have speculated that pycnofibers were an antecedent of proto-feathers, but the available impressions of pterosaur integuments are not like the "quills" found on many of the bird-like maniraptoran specimens in the fossil record. Pterosaur pycnofibers were structured similarly to theropod proto-feathers. Pycnofibers were flexible, short filaments, "only 5-7mm in some specimens" and rather simple, "apparently lacking any internal detail aside from a central canal". Pterosaur "pelts" found "preserved in concentrated, dense mats of fibers, similar to those found surrounding fossilized mammals" suggest coats with a thickness comparable to many Mesozoic mammals, at least on the parts of the pterosaur covered in pycnofibers. The coat thickness, and surface area covered, definitely varied by pterosaur species. The presence of pycnofibers (and the demands of flight) imply that pterosaurs were endothermic (warm-blooded). The absence of pycnofibers on pterosaur wings suggests that the coat did not have an aerodynamic function, lending support to the idea that pycnofibers evolved to aid pterosaur thermoregulation, as is common in warm-blooded animals, insulation being necessary to conserve the heat created by an endothermic metabolism. 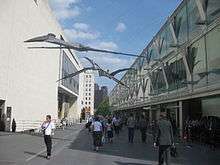 In 1985, the Smithsonian Institution commissioned aeronautical engineer Paul MacCready to build a half-scale working model of Quetzalcoatlus northropi. The replica was launched with a ground-based winch. It flew several times in 1986 and was filmed as part of the Smithsonian's IMAX film On the Wing. However, the model was not anatomically correct and embodied vertical and horizontal tail stabilizers that pterosaurs did not have. It also had a longer tail, changing the weight distribution. A 2009 study showed that pterosaurs had a lung-air sac system and a precisely controlled skeletal breathing pump, which supports a flow-through pulmonary ventilation model in pterosaurs, analogous to that of birds. The presence of a subcutaneous air sac system in at least some pterodactyloids would have further reduced the density of the living animal. Like modern crocodilians, pterosaurs appeared to have had a hepatic piston, seeing as their shoulder-pectoral girdles were too inflexible to move the sternum as in birds, and they possessed strong gastralia. Thus, their respiratory system had characteristics comparable to both modern archosaur clades. An X-ray study of pterosaur brain cavities revealed that the animals (Rhamphorhynchus muensteri and Anhanguera santanae) had massive flocculi. The flocculus is a brain region that integrates signals from joints, muscles, skin and balance organs. The pterosaurs' flocculi occupied 7.5% of the animals' total brain mass, more than in any other vertebrate. Birds have unusually large flocculi compared with other animals, but these only occupy between 1 and 2% of total brain mass. The flocculus sends out neural signals that produce small, automatic movements in the eye muscles. These keep the image on an animal's retina steady. Pterosaurs may have had such a large flocculus because of their large wing size, which would mean that there was a great deal more sensory information to process. The low relative mass of the flocculi in birds is also a result of birds having a much larger brain overall, indicating that pterosaurs lived in a structurally simpler environment, and had less complex behaviour compared to birds. Studies on the endocast of Allkaruen show that brain evolution in pterodactyloids was a modular process. There was considerable debate whether pterosaurs ambulated as quadrupeds or as bipeds. 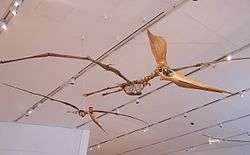 In the 1980s, paleontologist Kevin Padian suggested that smaller pterosaurs with longer hindlimbs, such as Dimorphodon, might have walked or even run bipedally, in addition to flying, like road runners. However, a large number of pterosaur trackways were later found with a distinctive four-toed hind foot and three-toed front foot; these are the unmistakable prints of pterosaurs walking on all fours. Fossil trackways show that pterosaurs like Quetzalcoatlus northropi were quadrupeds. The relative size of the hands and feet in pterosaurs (by comparison with modern animals such as birds) may indicate the type of lifestyle pterosaurs led on the ground. Azhdarchid pterosaurs had relatively small feet compared to their body size and leg length, with foot length only about 25%–30% the length of the lower leg. This suggests that azhdarchids were better adapted to walking on dry, relatively solid ground. Pteranodon had slightly larger feet (47% the length of the tibia), while filter-feeding pterosaurs like the ctenochasmatoids had very large feet (69% of tibial length in Pterodactylus, 84% in Pterodaustro), adapted to walking in soft muddy soil, similar to modern wading birds. Though clearly forelimb-based launchers, basal pterosaurs have hindlimbs well adapted for hopping, suggesting a connection with archosaurs such as Scleromochlus. Pterosaurs are known to have been eaten by theropods. In the 1 July 2004 edition of Nature, paleontologist Eric Buffetaut discusses an early Cretaceous fossil of three cervical vertebrae of a pterosaur with the broken tooth of a spinosaur embedded in it. The vertebrae are known not to have been eaten and exposed to digestion, as the joints are still articulated. A Darwinopterus specimen showcases that at least some pterosaurs had a pair of functional ovaries, as opposed to the single functional ovivary in birds, dismissing the reduction of functional ovaries as a requirement for powered flight. Two researchers, Chris Bennett (1996) and David Peters (2000), have found pterosaurs to be protorosaurs or closely related to them. Peters used a technique called DGS, which involves applying the digital tracing features of photo editing software to images of pterosaur fossils. Bennett only recovered pterosaurs as close relatives of the protorosaurs after removing characteristics of the hind limb from his analysis, in an attempt to test the idea that these characters are the result of convergent evolution between pterosaurs and dinosaurs. However, subsequent analysis by Dave Hone and Michael Benton (2007) could not reproduce this result. Hone and Benton found pterosaurs to be closely related to dinosaurs even without hind limb characters. They also criticized previous studies by David Peters, raising questions about whether conclusions reached without access to the primary evidence, that is, pterosaur fossils, can be held to have the same weight as conclusions based strictly on first-hand interpretation. Hone and Benton concluded that, although more primitive pterosauromorphs are needed to clarify their relationships, pterosaurs are best considered archosaurs, and specifically ornithodirans, given current evidence. In Hone and Benton's analysis, pterosaurs are either the sister group of Scleromochlus or fall between it and Lagosuchus on the ornithodiran family tree. Sterling Nesbitt (2011) found strong support for a clade composed of Scleromochlus and pterosaurs. More recent studies on basal pterosaur hindlimb morphology seem to vindicate a connection to Scleromochlus. Like this archosaur, basal pterosaur lineages have plantigrade hindlimbs that show adaptations for saltitation. For more details on this topic, see List of pterosaur classifications. It was once thought that competition with early bird species might have resulted in the extinction of many of the pterosaurs. By the end of the Cretaceous, only large species of pterosaurs are known (but see below). The smaller species were thought to have become extinct, their niche filled by birds. However, pterosaur decline (if actually present) seems unrelated to bird diversity, as ecological overlap between the two groups appears to be minimal. At the end of the Cretaceous period, the Cretaceous–Paleogene extinction event, which wiped out all non-avian dinosaurs and most avian dinosaurs as well, and many other animals, seems also to have taken the pterosaurs. In the early 2010s, several new pterosaur taxa were discovered dating to the Campanian/Maastrichtian, such as the ornithocheirids Piksi and "Ornithocheirus", possible pteranodontids and nyctosaurids, several tapejarids and the indeterminate non-azhdarchid Navajodactylus. This suggests that late Cretaceous pterosaur faunas were far more diverse than previously thought, possibly not even having declined significantly from the early Cretaceous. 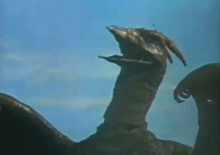 Scene from Rodan (1956), a kaiju film featuring a mutated pterosaur. While the generic term "pterodactyl" is often used to describe these creatures, the animals depicted frequently represent either Pteranodon or Rhamphorhynchus, or a fictionalized hybrid of the two. Many children's toys and cartoons feature "pterodactyls" with Pteranodon-like crests and long, Rhamphorhynchus-like tails and teeth, a combination that never existed in nature. However, at least one type of pterosaur did have the Pteranodon-like crest and teeth—for example, the Ludodactylus, a name that means "toy finger" for its resemblance to old, inaccurate children's toys. Also, some depictions of pterosaurs incorrectly identify them as "birds", when in real life they were flying reptiles, and birds are actually descended from theropod dinosaurs. In most media appearances, pterosaurs are depicted as aerial predators similar to birds of prey, grasping human victims with their taloned feet. No pterosaur species known so far possesses prehensile feet; all known pterosaurs have flat, plantigrade feet with no opposable toes, often poorly muscled and, in the case of pteranodontians, generally proportionally small. However, some pterosaurs might have had raptorial tendencies; Thalassodromeus possesses powerful jaws akin to those of phorusrhacids, and Hatzegopteryx's short neck and more powerful jaws have been interpreted as a speciation on larger prey. ↑ Andres, B.; Clark, J.; Xu, X. (2014). "The Earliest Pterodactyloid and the Origin of the Group". Current Biology. 24 (9): 1011–6. doi:10.1016/j.cub.2014.03.030. PMID 24768054. ↑ "Pterosaur distribution in time and space: an atlas" (PDF). Zitteliana: 61–107. 2008. ↑ Elgin RA, Hone DW, Frey E (2011). "The Extent of the Pterosaur Flight Membrane". Acta Palaeontologica Polonica. 56 (1): 99–111. doi:10.4202/app.2009.0145. 1 2 Wang, X.; Kellner, A.W.A. ; Zhou, Z.; Campos, D.A. (2008). "Discovery of a rare arboreal forest-dwelling flying reptile (Pterosauria, Pterodactyloidea) from China". Proceedings of the National Academy of Sciences. 105 (6): 1983–1987. doi:10.1073/pnas.0707728105. PMC 2538868 . PMID 18268340. ↑ Lawson DA (March 1975). "Pterosaur from the Latest Cretaceous of West Texas: Discovery of the Largest Flying Creature". Science. 187 (4180): 947–948. doi:10.1126/science.187.4180.947. PMID 17745279. ↑ Buffetaut E, Grigorescu D, Csiki Z (April 2002). "A new giant pterosaur with a robust skull from the latest cretaceous of Romania". Naturwissenschaften. 89 (4): 180–4. doi:10.1007/s00114-002-0307-1. PMID 12061403. ↑ Benton, Michael J. (2004). "Origin and relationships of Dinosauria". In Weishampel, David B.; Dodson, Peter; Osmólska, Halszka. The Dinosauria (2nd ed.). Berkeley: University of California Press. pp. 7–19. ISBN 0-520-24209-2. 1 2 Naish, Darren. "Pterosaurs: Myths and Misconceptions". Pterosaur.net. Retrieved June 18, 2011. 1 2 Arnold, Caroline & Caple, Laurie A. (2004). "Pterodactyl". Pterosaurs: rulers of the skies in the dinosaur age. Houghton Mifflin Harcourt. p. 23. ISBN 978-0-618-31354-9. 1 2 Alexander, David E. & Vogel, Steven (2004). Nature's Flyers: Birds, Insects, and the Biomechanics of Flight. JHU Press. p. 191. ISBN 978-0-8018-8059-9. ↑ Redfern, Ron (2001). Origins: the evolution of continents, oceans, and life. University of Oklahoma Press. p. 335. ISBN 978-0-8061-3359-1. 1 2 3 4 Witmer LM, Chatterjee S, Franzosa J, Rowe T (2003). 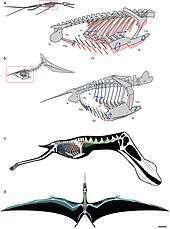 "Neuroanatomy of flying reptiles and implications for flight, posture and behaviour". Nature. 425 (6961): 950–3. doi:10.1038/nature02048. PMID 14586467. ↑ Bennett SC (2000). "Pterosaur flight: the role of actinofibrils in wing function". Historical Biology. 14 (4): 255–84. doi:10.1080/10292380009380572. 1 2 3 Kellner, A.W.A. ; Wang, X.; Tischlinger, H.; Campos, D.; Hone, D.W.E. ; Meng, X. (2009). "The soft tissue of Jeholopterus (Pterosauria, Anurognathidae, Batrachognathinae) and the structure of the pterosaur wing membrane". Proceedings of the Royal Society B. 277 (1679): 321–329. doi:10.1098/rspb.2009.0846. PMC 2842671 . PMID 19656798. 1 2 3 4 5 Naish D, Martill DM (2003). "Pterosaurs — a successful invasion of prehistoric skies". Biologist. 50 (5): 213–6. ↑ Wilkinson MT, Unwin DM, Ellington CP (2006). "High lift function of the pteroid bone and forewing of pterosaurs". Proceedings of the Royal Society B. 273 (1582): 119–26. doi:10.1098/rspb.2005.3278. PMC 1560000 . PMID 16519243. ↑ Bennett SC (2007). "Articulation and Function of the Pteroid Bone of Pterosaurs". Journal of Vertebrate Paleontology. 27 (4): 881–91. doi:10.1671/0272-4634(2007)27[881:AAFOTP]2.0.CO;2. ↑ Peters D (2009). "A reinterpretation of pteroid articulation in pterosaurs". Journal of Vertebrate Paleontology. 29 (4): 1327–1330. doi:10.1671/039.029.0407. ↑ Zhou, Chang-Fu; Schoch, Rainer R. (2011). "New material of the non-pterodactyloid pterosaur Changchengopterus pani Lü, 2009 from the Late Jurassic Tiaojishan Formation of western Liaoning". Neues Jahrbuch für Geologie und Paläontologie–Abhandlungen. 260 (3): 265–275. doi:10.1127/0077-7749/2011/0131. ↑ Wang, Xiao-Lin; Kellner, Alexander W. A.; Jiang, Shun-Xing; Cheng, Xin; Meng, Xi; Rodrigues, Taissa (2010). "New long-tailed pterosaurs (Wukongopteridae) from western Liaoning, China". Anais da Academia Brasileira de Ciências. 82 (4): 1045–1062. doi:10.1590/s0001-37652010000400024. ↑ Wilkinson M.T. ; Unwin D.M. ; Ellington C.P. (2006). "High lift function of the pteroid bone and forewing of pterosaurs". Proceedings of the Royal Society B. 273 (1582): 119–126. doi:10.1098/rspb.2005.3278. PMC 1560000 . PMID 16519243. 1 2 Unwin DM, Bakhurina NN (1994). "Sordes pilosus and the nature of the pterosaur flight apparatus". Nature. 371 (6492): 62–4. doi:10.1038/371062a0. ↑ Wang X, Zhou Z, Zhang F, Xu X (2002). "A nearly completely articulated rhamphorhynchoid pterosaur with exceptionally well-preserved wing membranes and "hairs" from Inner Mongolia, northeast China". Chinese Science Bulletin. 47 (3): 3. doi:10.1360/02tb9054. ↑ Frey, E.; Tischlinger, H.; Buchy, M.-C.; Martill, D. M. (2003). "New specimens of Pterosauria (Reptilia) with soft parts with implications for pterosaurian anatomy and locomotion". Geological Society, London, Special Publications. 217: 233–266. doi:10.1144/GSL.SP.2003.217.01.14. ↑ Dyke GJ, Nudds RL, Rayner JM (July 2006). "Limb disparity and wing shape in pterosaurs". J. Evol. Biol. 19 (4): 1339–42. doi:10.1111/j.1420-9101.2006.01096.x. PMID 16780534. 1 2 3 4 Witton MP, Naish D (2008). McClain, Craig R., ed. "A reappraisal of azhdarchid pterosaur functional morphology and paleoecology". PLoS ONE. 3 (5): e2271. doi:10.1371/journal.pone.0002271. PMC 2386974 . PMID 18509539. 1 2 3 4 5 6 7 Unwin, David M. (2006). The Pterosaurs: From Deep Time. New York: Pi Press. p. 246. ISBN 0-13-146308-X. 1 2 Frey E, Martill DM (1998). "Soft tissue preservation in a specimen of Pterodactylus kochi (Wagner) from the Upper Jurassic of Germany". Neues Jahrbuch für Geologie und Paläontologie, Abhandlungen. 210: 421–41. 1 2 3 4 5 6 7 Witton, Mark (2013). 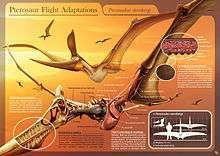 Pterosaurs: Natural History, Evolution, Anatomy. Princeton University Press. p. 51. ISBN 978-0691150611. ↑ Cuvier G (1801). "[Reptile volant]. In: Extrait d'un ouvrage sur les espèces de quadrupèdes dont on a trouvé les ossemens dans l'intérieur de la terre". Journal de Physique, de Chimie et d'Histoire Naturelle. 52: 253–267. 1 2 Alleyne, Richard (1 October 2008). "Pterodactyls were too heavy to fly, scientist claims". The Telegraph. Retrieved 2 March 2012. ↑ Powell, Devin (2 October 2008). "Were pterosaurs too big to fly?". NewScientist. Retrieved 2 March 2012. ↑ Naish, Darren (February 18, 2009). "Pterosaurs breathed in bird-like fashion and had inflatable air sacs in their wings". ScienceBlogs. Archived from the original on February 21, 2009. Retrieved 3 April 2016. 1 2 3 "Why pterosaurs weren't so scary after all". The Observer newspaper. 11 August 2013. Retrieved 12 August 2013. 1 2 Hecht, Jeff (16 November 2010). "Did giant pterosaurs vault aloft like vampire bats?". NewScientist. Retrieved 2 March 2012. ↑ Witton, Mark P.; Martill, David M.; Loveridge, Robert F. (2010). "Clipping the Wings of Giant Pterosaurs: Comments on Wingspan Estimations and Diversity". Acta Geoscientica Sinica. 31: 79–81. ↑ Geist, N.; Hillenius, W.; Frey, E.; Jones, T.; Elgin, R. (2014). "Breathing in a box: Constraints on lung ventilation in giant pterosaurs". The Anatomical Record. 297 (12): 2233–2253. doi:10.1002/ar.22839. PMID 24357452. ↑ Hopson J.A. (1977). "Relative Brain Size and Behavior in Archosaurian Reptiles". Annual Review of Ecology and Systematics. 8: 429–448. doi:10.1146/annurev.es.08.110177.002241. ↑ Laura Codorniú; Ariana Paulina Carabajal; Diego Pol; David Unwin; Oliver W.M. Rauhut (2016). "A Jurassic pterosaur from Patagonia and the origin of the pterodactyloid neurocranium". PeerJ. 4: e2311. doi:10.7717/peerj.2311. ↑ Padian K (1983). "A Functional Analysis of Flying and Walking in Pterosaurs". Paleobiology. 9 (3): 218–39. JSTOR 2400656. ↑ Padian K (2003). "Pterosaur Stance and Gait and the Interpretation of Trackways". Ichnos. 10 (2–4): 115–126. doi:10.1080/10420940390255501. ↑ Hwang K, Huh M, Lockley MG, Unwin DM, Wright JL (2002). 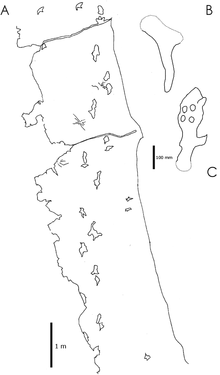 "New pterosaur tracks (Pteraichnidae) from the Late Cretaceous Uhangri Formation, southwestern Korea". Geological Magazine. 139 (4): 421–35. doi:10.1017/S0016756802006647. 1 2 3 4 Witton, Mark P. (2015). "Were early pterosaurs inept terrestrial locomotors?". PeerJ. 3: e1018. doi:10.7717/peerj.1018. PMC 4476129 . PMID 26157605. ↑ Unwin DM (1997). "Pterosaur tracks and the terrestrial ability of pterosaurs". Lethaia. 29 (4): 373–86. doi:10.1111/j.1502-3931.1996.tb01673.x. ↑ Buffetaut E, Martill D, Escuillié F (July 2004). "Pterosaurs as part of a spinosaur diet". Nature. 430 (6995): 33. doi:10.1038/430033a. PMID 15229562. ↑ Ji Q, Ji SA, Cheng YN, et al. (December 2004). "Palaeontology: pterosaur egg with a leathery shell". Nature. 432 (7017): 572. doi:10.1038/432572a. PMID 15577900. ↑ Lü J.; Unwin D.M. ; Deeming D.C.; Jin X.; Liu Y.; Ji Q. (2011). "An egg-adult association, gender, and reproduction in pterosaurs". Science. 331 (6015): 321–324. doi:10.1126/science.1197323. PMID 21252343. ↑ Wang, Xiaolin (2014). "Sexually Dimorphic Tridimensionally Preserved Pterosaurs and Their Eggs from China". Current Biology. 24 (12): 1323–1330. doi:10.1016/j.cub.2014.04.054. PMID 24909325. ↑ Grellet-Tinner G, Wroe S, Thompson MB, Ji Q (2007). "A note on pterosaur nesting behavior". Historical Biology. 19 (4): 273–7. doi:10.1080/08912960701189800. ↑ Xiaolin Wang, Kellner Alexander W.A. ; Cheng, Xin; Jiang, Shunxing; Wang, Qiang; Sayão Juliana, M.; Rordrigues Taissa, Costa Fabiana R.; Li, Ning; Meng, Xi; Zhou, Zhonghe (2015). "Eggshell and Histology Provide Insight on the Life History of a Pterosaur with Two Functional Ovaries". Anais da Academia Brasileira de Ciências. 87 (3): 1599–1609. doi:10.1590/0001-3765201520150364. ↑ Wang X, Zhou Z (June 2004). "Palaeontology: pterosaur embryo from the Early Cretaceous". Nature. 429 (6992): 621. doi:10.1038/429621a. PMID 15190343. 1 2 3 Bennett S. C. (1995). "A statistical study of Rhamphorhynchus from the Solnhofen Limestone of Germany: Year-classes of a single large species". Journal of Paleontology. 69: 569–580. JSTOR 1306329. 1 2 Prondvai, E.; Stein, K.; Ősi, A.; Sander, M. P. (2012). Soares, Daphne, ed. "Life history of Rhamphorhynchus inferred from bone histology and the diversity of pterosaurian growth strategies". PLoS ONE. 7 (2): e31392. doi:10.1371/journal.pone.0031392. PMC 3280310 . PMID 22355361. ↑ Irmis, R. B.; Nesbitt, S. J.; Padian, K.; Smith, N. D.; Turner, A. H.; Woody, D.; Downs, A. (2007). "A Late Triassic Dinosauromorph Assemblage from New Mexico and the Rise of Dinosaurs". Science. 317 (5836): 358–61. doi:10.1126/science.1143325. PMID 17641198. 1 2 Hone D.W.E. ; Benton M.J. (2007). "An evaluation of the phylogenetic relationships of the pterosaurs to the archosauromorph reptiles". Journal of Systematic Palaeontology. 5 (4): 465–469. doi:10.1017/S1477201907002064. ↑ Kellner, A. W. (2003). "Pterosaur phylogeny and comments on the evolutionary history of the group". Geological Society, London, Special Publications. 217 (1): 105–137. doi:10.1144/gsl.sp.2003.217.01.10. ↑ Padian, K. (1997). "Pterosauromorpha", pp. 617–618 in Currie, P.J. and Padian, K. The Encyclopedia of Dinosaurs. Academic Press. ISBN 0122268105. ↑ Lü J.; Unwin D.M. ; Xu L.; Zhang X. (2008). "A new azhdarchoid pterosaur from the Lower Cretaceous of China and its implications for pterosaur phylogeny and evolution". Naturwissenschaften. 95 (9): 891–897. doi:10.1007/s00114-008-0397-5. PMID 18509616. 1 2 Andres, B.; Myers, T. S. (2013). "Lone Star Pterosaurs". Earth and Environmental Science Transactions of the Royal Society of Edinburgh. 103 (3–4): 1. doi:10.1017/S1755691013000303. ↑ Slack KE, Jones CM, Ando T, et al. (June 2006). "Early penguin fossils, plus mitochondrial genomes, calibrate avian evolution". Mol. Biol. Evol. 23 (6): 1144–55. doi:10.1093/molbev/msj124. PMID 16533822. ↑ Butler, Richard J.; Barrett, Paul M.; Nowbath, Stephen & Upchurch, Paul (2009). "Estimating the effects of sampling biases on pterosaur diversity patterns: implications for hypotheses of bird/pterosaur competitive replacement". Paleobiology. 35 (3): 432–446. doi:10.1666/0094-8373-35.3.432. ↑ Agnolin, Federico L. & Varricchio, David (2012). "Systematic reinterpretation of Piksi barbarulna Varricchio, 2002 from the Two Medicine Formation (Upper Cretaceous) of Western USA (Montana) as a pterosaur rather than a bird" (PDF). Geodiversitas. 34 (4): 883–894. doi:10.5252/g2012n4a10. ↑ Elizabeth Martin-Silverstone; Mark P. Witton; Victoria M. Arbour; Philip J. Currie (2016). "A small azhdarchoid pterosaur from the latest Cretaceous, the age of flying giants". Royal Society Open Science. 3 (8): 160333. doi:10.1098/rsos.160333. 1 2 3 Hone, D. (2010). "Pterosaurs In Popular Culture." Pterosaur.net, Accessed 27 August 2010. ↑ Frey, E., Martill, D., and Buchy, M. (2003). "A new crested ornithocheirid from the Lower Cretaceous of northeastern Brazil and the unusual death of an unusual pterosaur" in: Buffetaut, E., and Mazin, J.-M. (eds.). 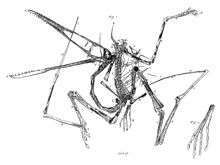 Evolution and Palaeobiology of Pterosaurs. Geological Society Special Publication 217: 56–63. ISBN 1-86239-143-2.